Ah, the golden age of shareware. As a video game crazy kid, shareware was a big part of my life. As I did not have an internet connection at the time, a friend of mine from up the road would download games onto a disk and bring them over to my house so we could play. The cheap floppy diskettes containing various shareware games sold at local convenience stores were also an option. ZZT and Jazz Jackrabbit were a huge part of my elementary school years, especially ZZT’s game creating abilities. The subject of today’s article was a product of those days. Originally called Halloween Harry, this side-scrolling platform shooter that pits you against zombies and aliens had its name changed to Alien Carnage due to fears that the game would only sell well in October. 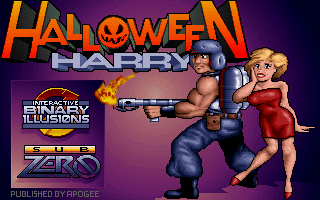 Wikipedia notes that while the first episode was released as shareware during the game’s “Halloween Harry” days, episode three became the free shareware giveaway when the name change, which meant that half of the game could be played for free. Wikipedia also has some handy information about the sequel and the never-realized animated series. I could be wrong here, but I think the only other shareware release that let you play more was 3D Realms’ own Shadow Warrior, which let you play all but the final episode for free. Of course, that’s meaningless now, since the full game was released as a free download in 2007. 3D Realms has also given away another game from their early days away as a free download: Bio Menace. Said game has you battling various mutant monsters through the streets of Metro City. Those who read its Wikipedia page will also find out how to access a special Easter Egg in it. Happy gaming! Special thanks to 3D Realms for the use of the image!